This Thursday, activists, culture managers and business leaders will flock to Prague and Pilsen for the Pilsen 2015 OPEN UP! Creative Placemaking Festival (hosted by the Aspen Institute and the Pilsen 2015 European Capital of Culture). Leaders ranging from Mark Davy, Founder of Futurecity, and Ann Markusen, Director of the Arts Economy Initiative at the University of Minnesota will come together for two days of panel discussions, working groups, and all around placemaking fun. Together they will work to envision and create better futures for their local communities through creative placemaking. The idea is simple: Funders are banding together to support projects that use the arts as catalysts for transforming spaces into places. Let’s take a look at Levitt Pavilion Los Angeles in MacArthur Park, a spot where creative placemaking has made a positive impact. Perhaps nothing speaks to MacArthur Park’s transformation better than the Levitt bandshell itself. With the 2007 launch of Levitt L.A., the national Levitt program gave new life to the abandoned graffiti-covered bandshell in the troubled park, removing the chainlink fence that surrounded the bandshell for decades and making it accessible to the public once more. Levitt’s positive programming has sparked a transformation in the once crime-ridden park. The park has now once again become a safe family-friendly gathering place for local residents and Angelenos citywide. Each year tens of thousands gather at the bandshall to enjoy Levitt L.A.’s 50 free concerts. Art transforming a place: THIS is the core of creative placemaking. Creative placemaking is a major U.S. cultural policy and funding trend that positions community-driven arts at the center of community planning and development. Artists and arts organizations have been using the arts to invigorate public spaces in their communities for centuries, so what’s so exciting about what’s happening now? Why are we calling it a creative placemaking movement? Words are powerful. In 2001, the influential economist and author Richard Florida set the stage for the creative placemaking movement when he reported that cities were more likely to flourish with high “creativity indexes.” In 2010, The Mayor’s Institute on City Design built upon this idea in a white paper on creative placemaking, which officially coined the term and set the wheels in motion for the movement. This was the fuel that Rocco Landesman, then Chairman of the National Endowment for the Arts, needed to pool together support for ArtPlace—an unprecedented collaborative effort between foundations and government agencies, who together have invested over $61.5 million in community-driven creative placemaking initiatives. ArtPlace funds a wide range of projects—large and small, rural and urban, permanent and temporary; from a $50,000 grant to create The River Arts Greenway in downtown Hazard, KY (population 5,500) to a $900,000 grant to create the Sugar Hill Arts District in Detroit, MI. A shift in the way funders want to interact with the arts – rooted in the makers movement, there is a growing interest in gaining access to the behind-the-scenes artistic process. How can we tell whether or not the time and money being put into creative placemaking initiatives is actually making a difference? Creative placemaking has already become the topic of a class at the New School and a certificate program at Ohio State University, as well as the major funding model for the Kresge Foundation. So what’s next? Some joke that the next milestone will be reached when Microsoft Word stops trying to autocorrect “placemaking” (and suggesting “platemaking” or “peacemaking” in its place). The movement is new, broad and ambitious, making it challenging to pinpoint indicators of success. However, funders are making progress in this department. ArtPlace is beginning to move in this direction with a list of ten signals grantees can use to judge whether their projects are making a difference. And here at Levitt Pavilions, we are in the midst of a multi-year study examining the social and economic impact of Levitt’s long-term creative placemaking projects across the country. 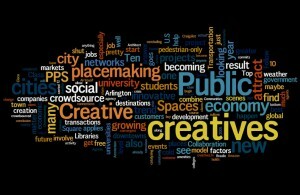 So in summary, what’s creative placemaking? A popular buzzword in the arts and culture sector? Yes, it’s all the rage. A community-driven approach that brings the arts to the table in community planning and development conversations? Yes! Any project or initiative that uses art to create and improve public places falls under this term. An exciting interdisciplinary cultural movement that continues to gain momentum? Yes, and it’s just getting started! A movement to make our communities more livable that’s near and dear to our hearts here at Levitt Pavilions? Yes, and we are on a roll! Stay tuned for exciting new placemaking projects in Denver and Houston! This entry was posted in Placemaking on November 4, 2014 by Nicole McGaffey. Thanks so much for sharing, Issac! We could not agree more. Many of us here at Levitt Pavilions are originally from smaller towns and have seen firsthand how impactful community-driven arts initiatives can be—regardless of scale. For this reason we’re so excited to launch the Levitt AMP [Your City] Grant Awards, which are designed to meet the needs and capacity of small and mid-sized cities. If you haven’t already, be sure to vote for your favorite Levitt AMP Applicant by November 30th! And keep up the great work in Middlesboro! Pingback: Announcing the Levitt AMP Anchorage, Denison and Frederick Lineups!